It’s been quite a journey since High Touch first opened its doors in 1984. Back then, Ronald Reagan was President of the U.S., a ticket to the movies cost $2.50, and a gallon of gas cost a measly $1.21. Since, High Touch has grown to a company with over 170 employees, and gas prices have more than doubled. 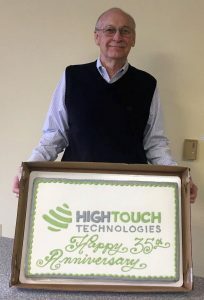 In 35 years, High Touch has built a reputation around our mission of providing the best technology, products, and services, exceeding our clients’ expectations, offering meaningful and rewarding careers for our employees, and enriching the community. Are you curious about how we got started or how we became one of the largest technology providers in the Midwest? Here’s a look at how High Touch has grown over the years. High Touch’s history dates back to the late 1970’s. In 1976, High Touch’s founder Professor Ted Cary decided to leave the Computer Science program and Wichita State University. Cary was interested in figuring out how technology could influence the deeper facets of business outside the academic arena of engineering and science. Cary recruited two of his brightest students, Dave Glover and Mark Lenz on his journey. Working alongside ABC Rentals, the team recognized a need for automation in the rent-to-own (RTO) industry and developed a custom point of sale (POS) software solution. By engineering custom software and working directly alongside ABC Rentals in development, Cary laid the foundation for High Touch’s software as a service (SaaS) business model. In fact, the focus on providing a service was so important, High Touch was one of the first technology companies of its kind to incorporate 24/7 service into its business model. High Touch’s doors officially opened on April 1, 1984. The name “High Touch” comes from John Naisbitt’s best-selling book “Megatrends.” The concept of, “high tech, high touch” recognizes that in a technology-driven world, people long for human contact. High Touch set out with the goal to bridge the gap between the cold, alien world of technology and the face-to-face comforts of the human world. In 1998, High Touch got a huge business boost when one of its clients, Ernie Talley of Renter’s Choice, purchased Thorne America, adding 1,447 stores to High Touch’s client base. By 1999, High Touch was up to over 2,000 clients and 62 employees. In 2002, High Touch doubled its client base again by purchasing RSSS, LP, which was a competing RTO software provider. By 2004, High Touch had over 4,000 clients and over 100 employees. During this time, High Touch also diversified its business model by expanding into IT Solutions, offering outsourced IT, data services, data backup (cloud and onsite), telephony, virtualization, and video conferencing. High Touch’s SaaS solutions evolved by offering customized software development programs. Some examples include building new platforms and migrating legacy programs to modern systems. Finally, with the foundation in place from its other ventures, High Touch began offering Website Services like web development and search engine optimization (SEO). After acquiring RSSS, LP, High Touch continued to grow by way of acquisition through the 2010’s. Since, High Touch has completed 10 additional acquisitions, growing its footprint into five additional metro areas: Corpus Christi, Dallas, Denver, Kansas City, and San Antonio. During this period, High Touch also relocated its corporate headquarters from Wichita’s Twin Lakes Shopping Center to the downtown 110 S. Main building. Originally, High Touch leased 35,000 square feet of the 106,000-square-foot building. In 2013, the company cemented its role in local redevelopment by purchasing the building from Chicago-based Main and Market Streets LLC. Most recently, High Touch has teamed up with Thrive Restaurant Group to engineer groundbreaking restaurant management software. Named Nigel, this POS software is a complete restaurant management platform for any sized restaurant ranging from fast food to fine dining. By integrating a kitchen display system (KDS) with orders placed by servers, Nigel simplifies communication between the front and back of the house, making sure restaurants run smoothly and efficiently. Nigel officially launched January 11, 2019. Going forward, current President and CEO Wayne Chambers announced his retirement on March 8, 2019. Derrick Nielsen, former Vice President of People Operations at Charles Machine Works and former Vice President of Organizational Development at Allen, Gibbs, and Houlik (AGH), will take office on April 15, 2019. Are you interested in learning about the products and services High Touch has to offer?